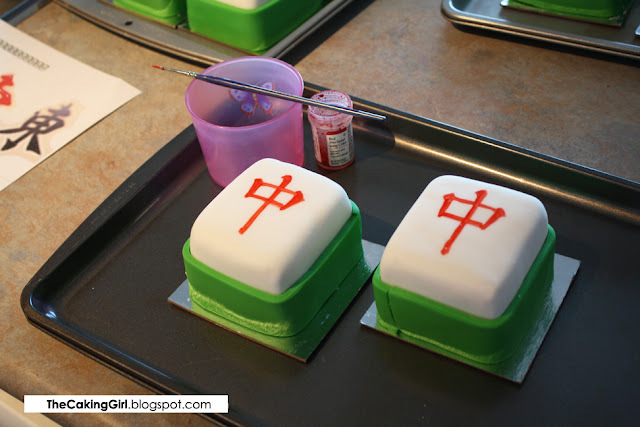 TheCakingGirl: Fondant Cake Decorating: Mahjong Cakes! 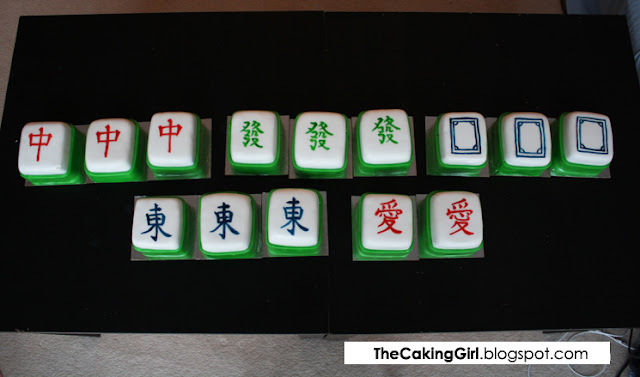 Fondant Cake Decorating: Mahjong Cakes! 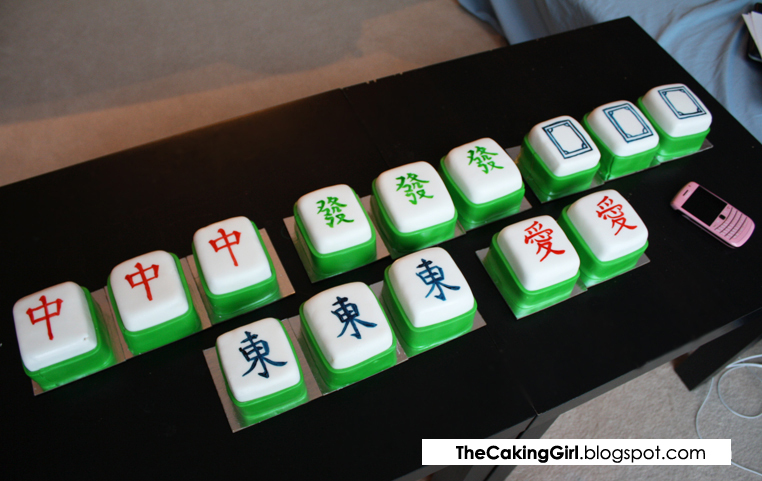 I made a set of Mahjong tile cakes for my friend. The most challenging part was cutting and making sure all the cakes were the same size. I was at the cake store recently and saw the rectangular cake dividers and didn't buy it, yep I was kicking myself for that! Took me about two hours to cut all 14 cakes and ice them. I had to make sure they were all the same size and all the angles were perpendicular. If any one of them were slanted, it would be obvious. I made vanilla cake with vanilla buttercream. A good way to see if your cakes are the same size is to use the negative space left from the cake board. I made sure the silver border was roughly half an inch on all four sides. The 14 cakes were not the same height so I used buttercream to add a bit of height to some of them to make them all the same. 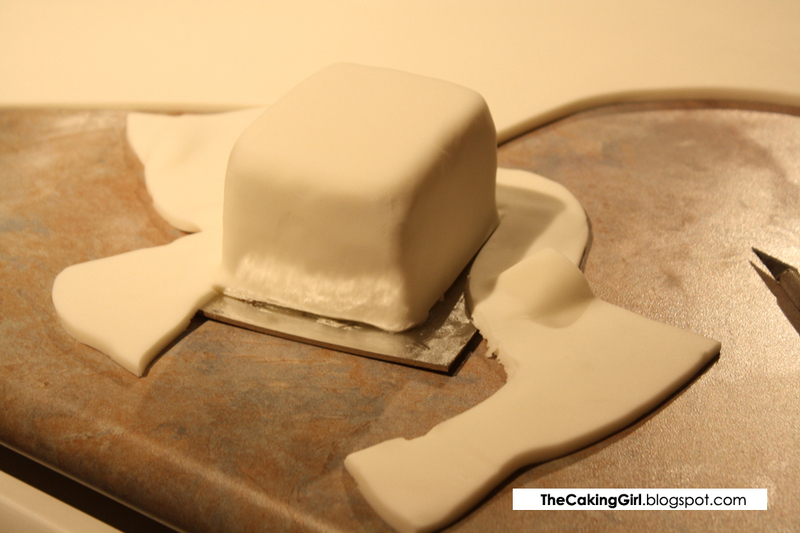 To make sure the angles are all perpendicular, I had to freeze the cake after each buttercream coating, this took most of the two hours. 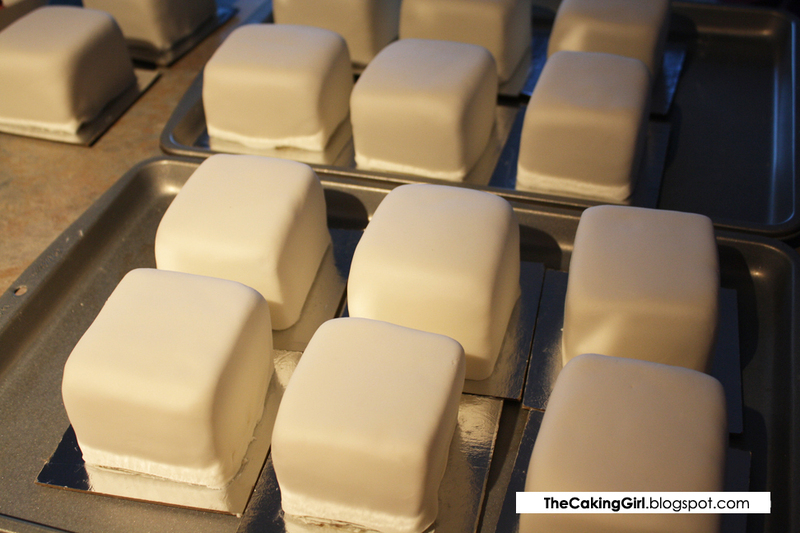 I rolled out the white fondant and covered each tile. 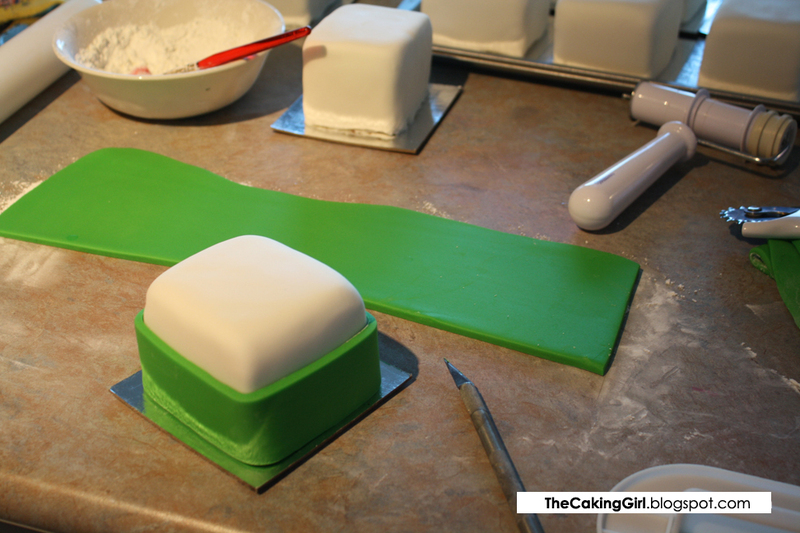 When you're working with a square/rectangular cake, always smooth out the corners first. Trim away the excess fondant and smooth it with the fondant smoother. 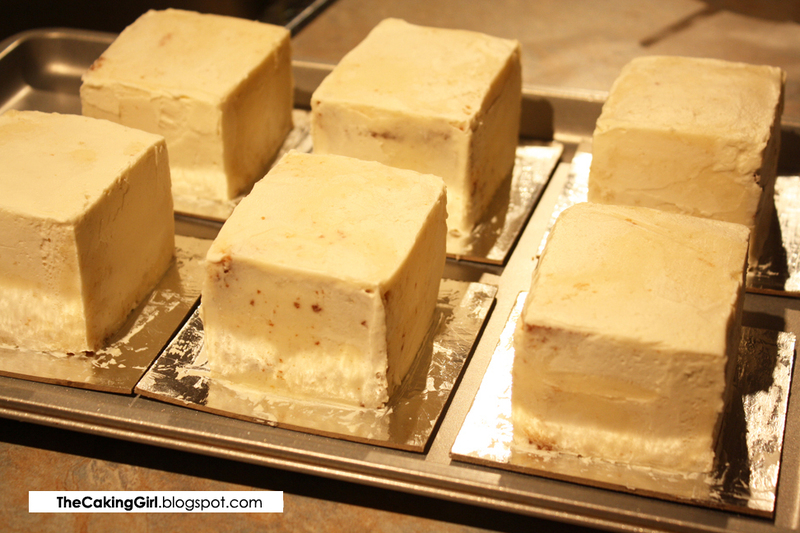 When you work with square/rectangular cakes, it's easier to smooth the cake with two smoothers. 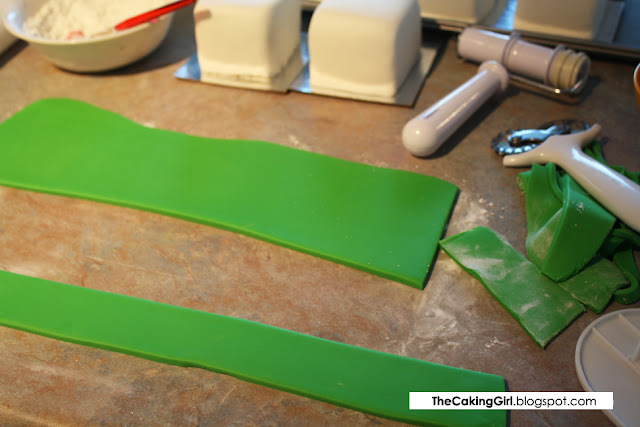 I made some green fondant with Leaf Green edible colouring, rolled it out (thinner than the white fondant) and cut it with the ribbon cutter. I attached it to the cake with water. You can see there isn't much of the silver cake board border left. 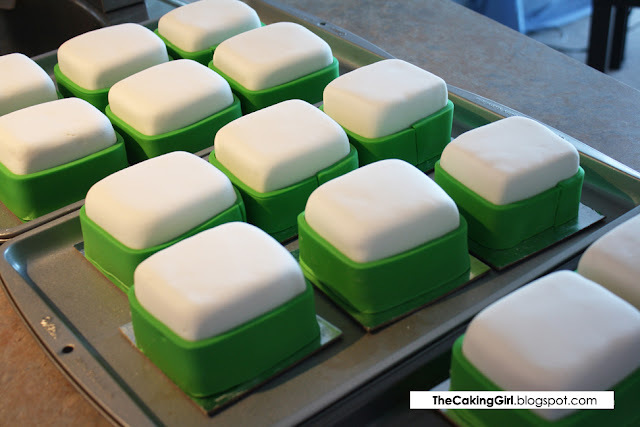 Be very careful when you place the cakes together in the box after, I had two of them touching and I had to redo the green layer. All 14 are covered with fondant and ready to be painted! You only get one shot at this, so don't make a mistake lol. 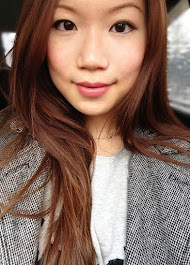 I'm Chinese but I never had to write Chinese characters.. so this was super difficult! 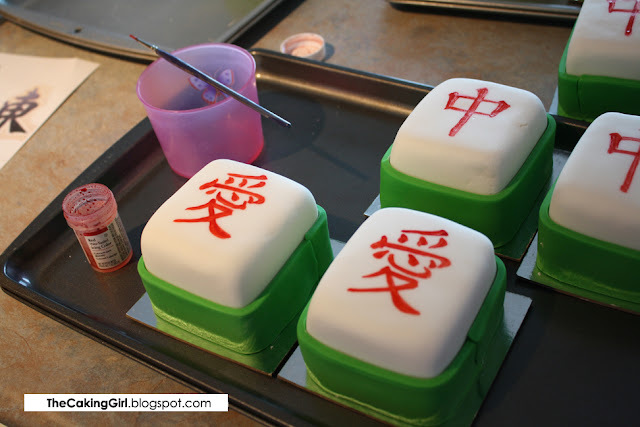 I've had to paint Chinese characters for other cakes before,. This is what I do...I paint the character with a thin line and then go back and thicken the line where it needs to be thickened as if you're the character was painted with a brush.. think of the character as a picture, and try to center it by looking at the negative spaces. I used the thinnest paint brush I have. I don't use cake painting brushes, the quality isn't there. I get brushes from Curry's Art store, they have wide selection of style and sizes. Here's all of them together :) So instead of the usual tiles for the 'pair of eyes', my friend wanted to use the character 'love'. So sweet! That's my blackberry on the table to show the size of the cakes. My friend thought they would each be the size of the actual tile lol, I made them way too big haha. the girl telling about the way she use to make cakes. I really love cooing and I use to read such posts all over the day and essayoneday com site provides well task. I need few more recipes. 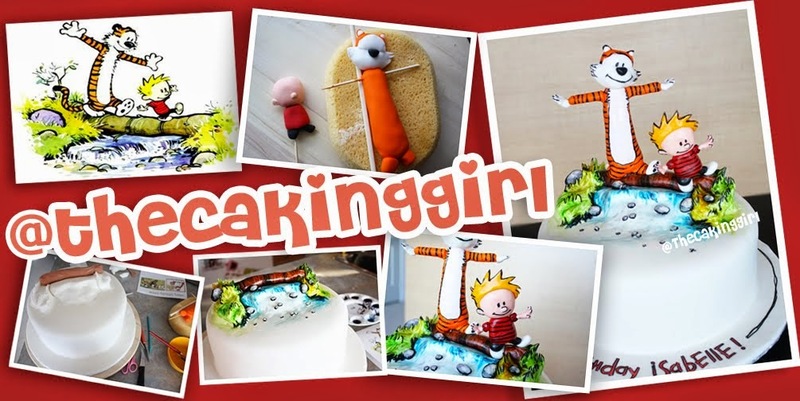 This post will really boost up the moral level of the girl as she is shown on the internet and she will try too bake more.